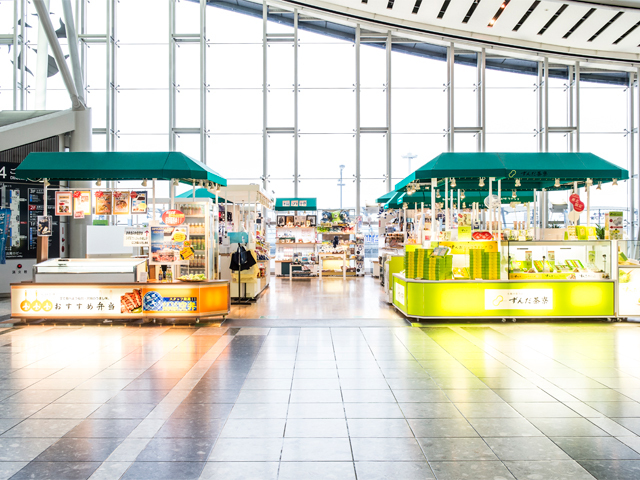 Introduction of SORABEN｜Sendai International Airport Co.,Ltd. 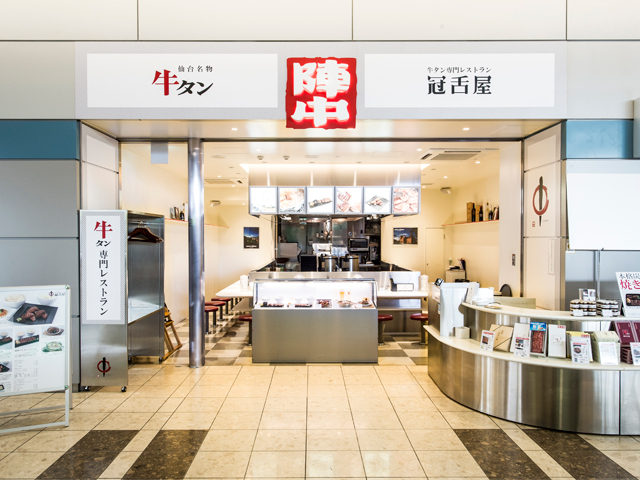 You can pre-order your Soraben (Airport's special boxed meals). If you would like to pre-order, please contact us at least 5 days before the day you would like them. We take orders from 3 Sorabens. 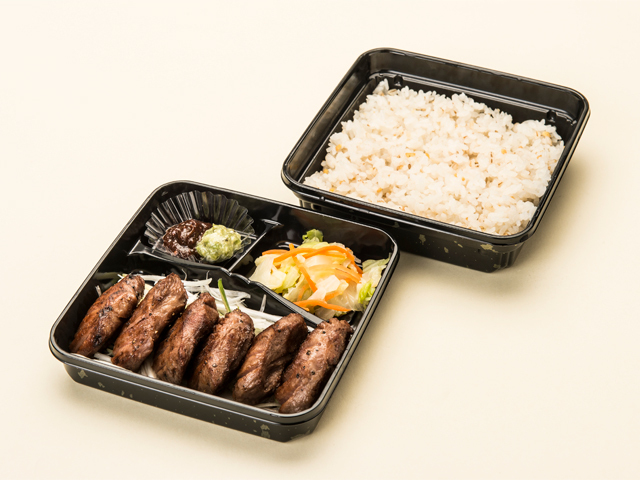 This is an orthodox ox tongue bento box which features charcoal grilled ox tongue which have been matured with salt-malted rice. Now it has thicker slices of ox tongue. Please enjoy Sendai's specialty, ox tongue. 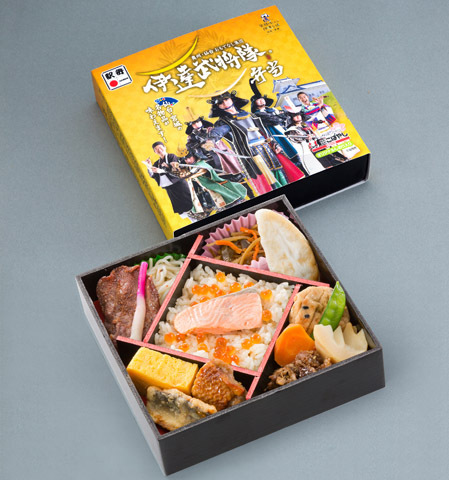 This is a deluxe seafood bento box featuring a Pacific saury from Kesennuma, salmon from Minamisanriku, oysters and a conger eel from Ishimaki and Sasa-kamaboko(Processed fish cake) from Onagawa. 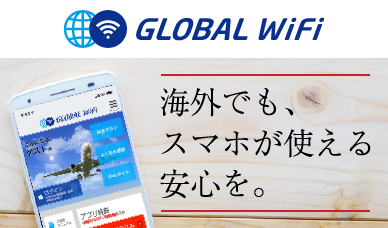 North-east district of Miyagi prefecture on the Pacific coast, from Kesennuma to Onagawa, had a number of gold mines which supported Hiraizumi's golden culture of the 4th generation of Oshu-Fujiwara clan, therefore this area is called "Golden Sea Route" . 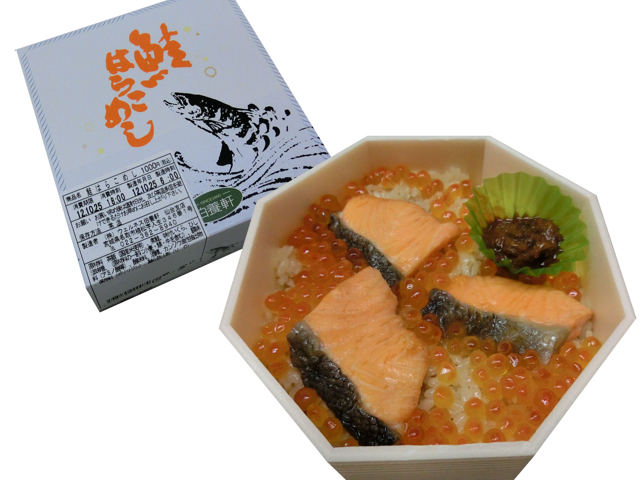 This fragrant rice dish is cooked and seasoned with a generous amount of salmon and salmon roe in season. 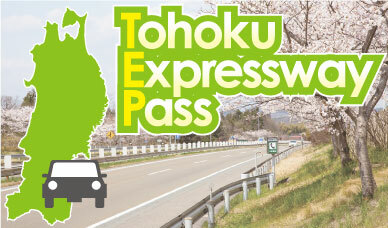 It is a representative local dish from Miyagi. 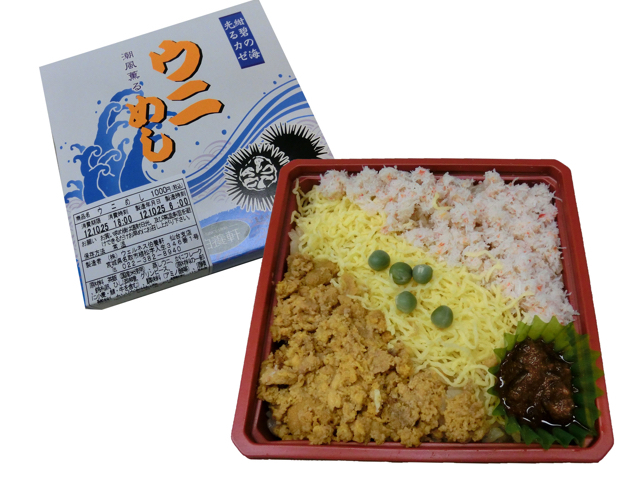 This is a bento box reflecting seafood from Sanriku which has a generous amount of sea urchin, crab meat and thinly cut omelet on top of rice with special seasoning. 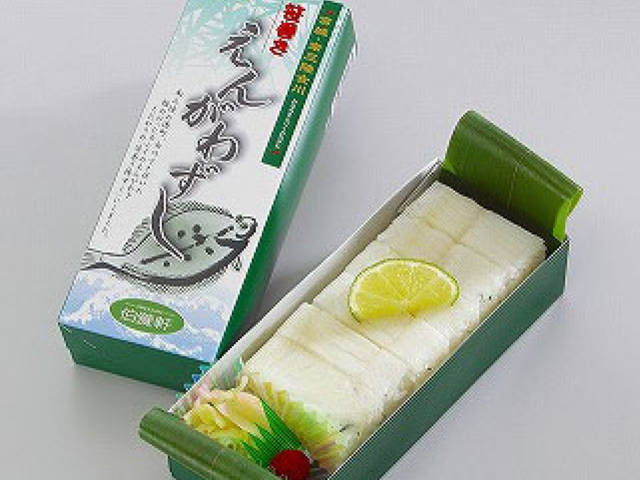 This is Oshizushi (pressed sushi) with flounder fin wrapped in bamboo leaves. 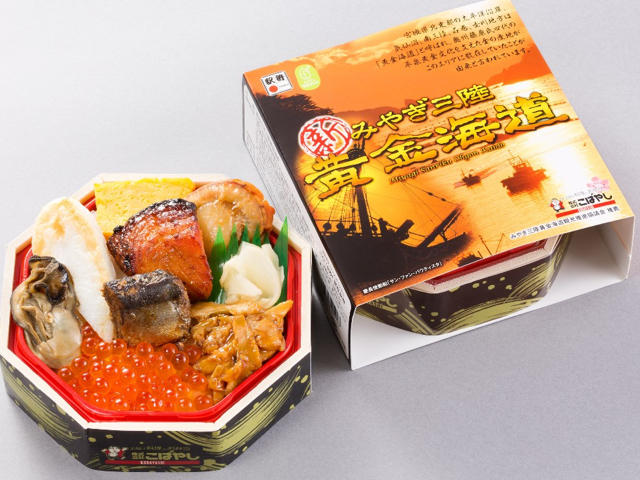 This deluxe bento contains Salmon Harako-meshi (salmon roe rice), sake lees marinated Coho salmon, Sendai's specialty Sasa-kamaboko, a special salad with Shiroishi Umen noodles, etc., which are specialty food produced in relevant areas to 5 different local samurais such as Masamune Date. 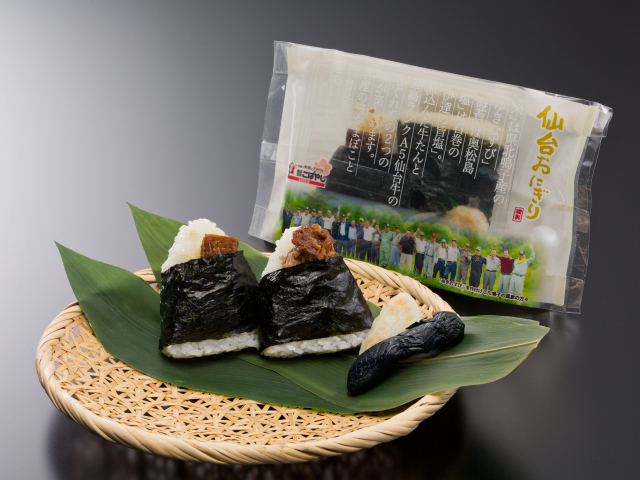 Ingredients are rice called "Yukimusubi" from Miyagi prefecture, "Nori (seaweed)" from Okumatsushima, "salt" from Ishimaki and inside the rice balls they have "simmered ox tongue" and "Sendai beef Shigureni (cooked with soy sauce, mirin and ginger)". 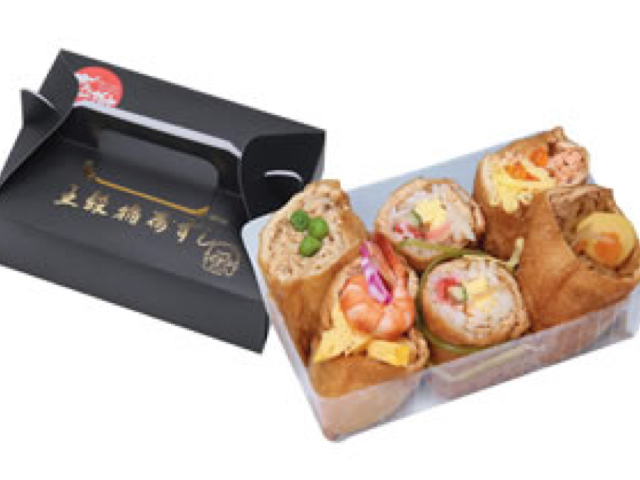 You can simply enjoy taste of Miyagi with this bento box. 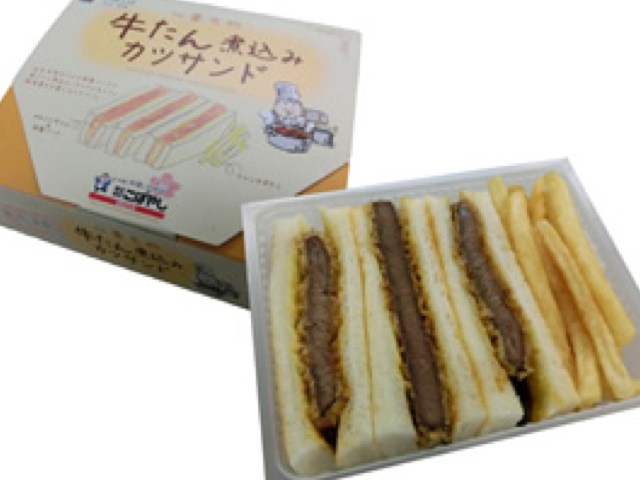 This sandwich has Sendai's specialty ox tongue which is simmered tender in the special sauce. 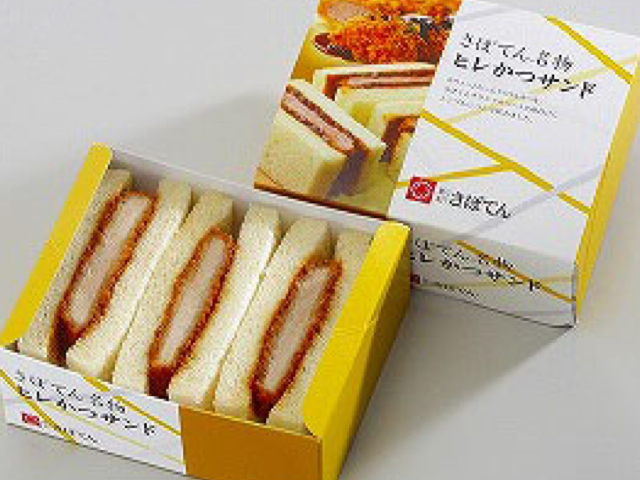 This is a new kind of Katsu sandwich you can only taste in Sendai. 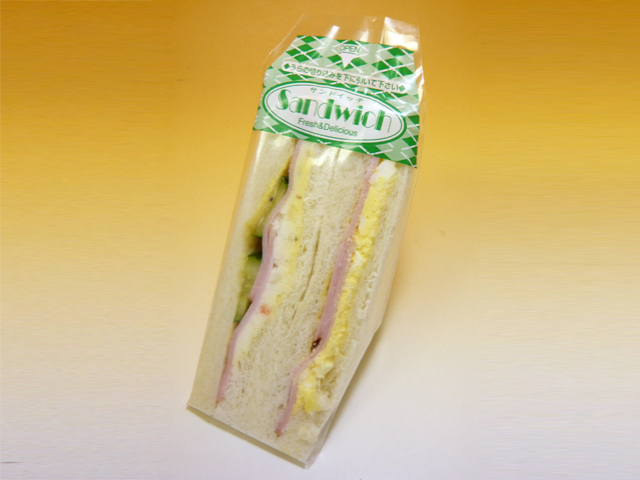 This is a big sandwich with popular pork fillet cutlet from a restaurant called Saboten. 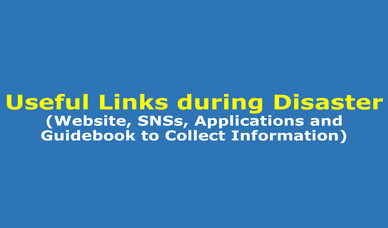 ※Only available on Fridays, Saturdays, Sundays and public holidays. 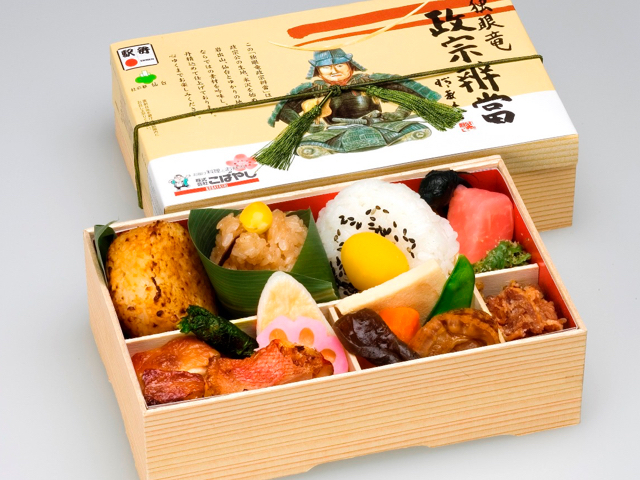 Dishes in this bento box are made of ingredients from relevant areas such as Iwadeyama and Sendai to the lord of Sendai Domain, Masamune Date. 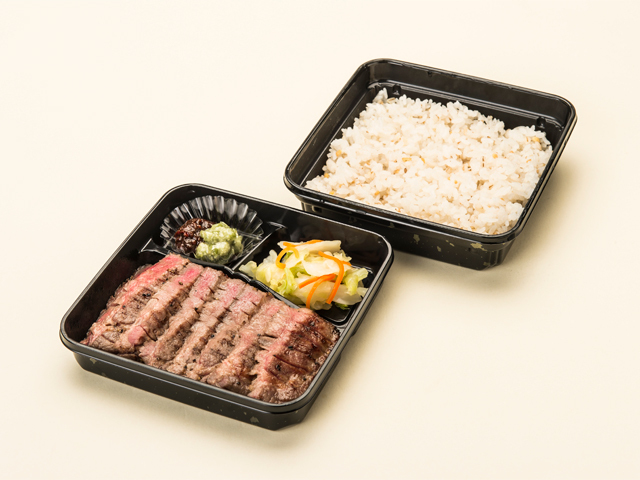 You can enjoy the taste of Miyagi with this one bento box. This one bento box has many different kinds of specialty food from all of the 6 prefectures in Tohoku Region such as Sasa-kamaboko(processed fish cake), Tender ox tongue stew, Yamagata Imoni (beef, taro and other vegetables cooked in a soy sauce based soup), Japanese style fried Pacific saury from Sanriku, grilled scallops marinated with miso and garlic, etc. 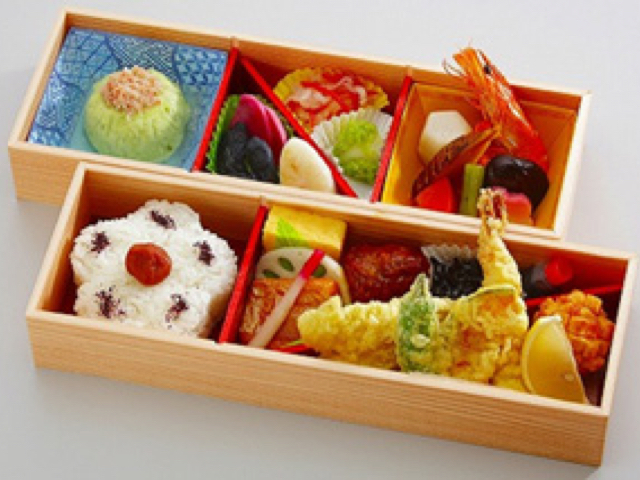 This 2 tier bento box has dishes seasoned simply with ingredients from Miyagi prefecture. 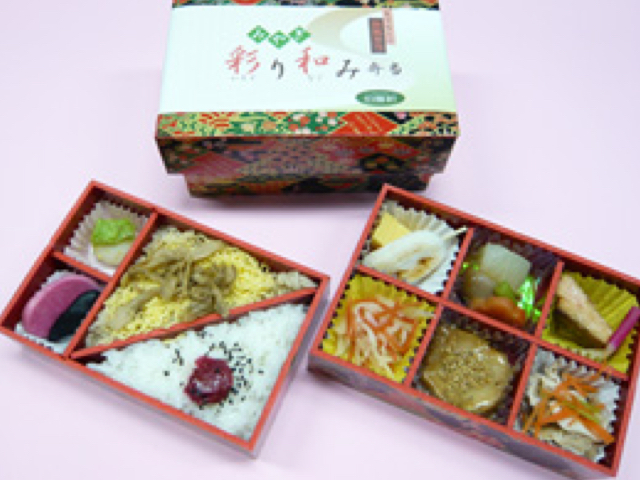 This deluxe bento box uses seasonal ingredients from Sendai. 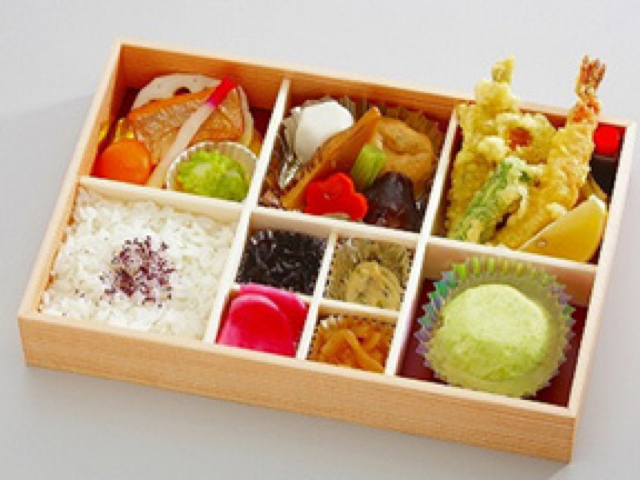 It is a sumptuous bento with various kinds of dishes such as pickles, fried dishes, simmered vegetables and so on. 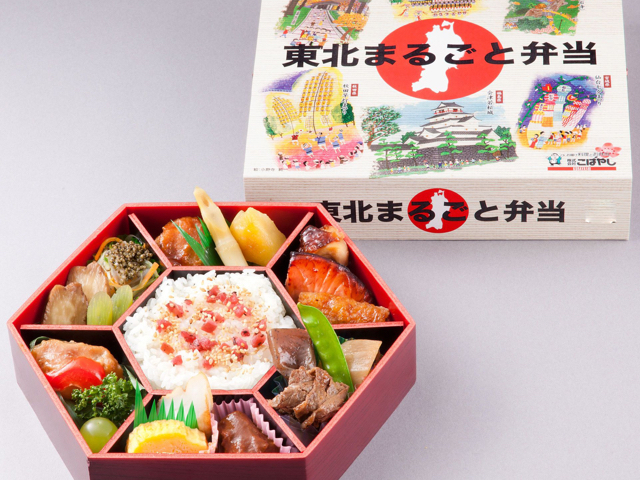 This is a bento box which appeals to your sight and taste. 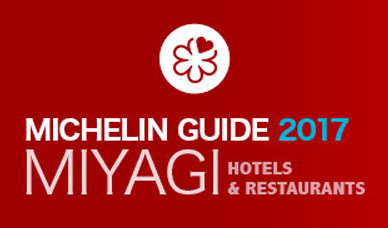 It has flavorful Inari with brown sugar and colorful seafood and vegetable toppings. 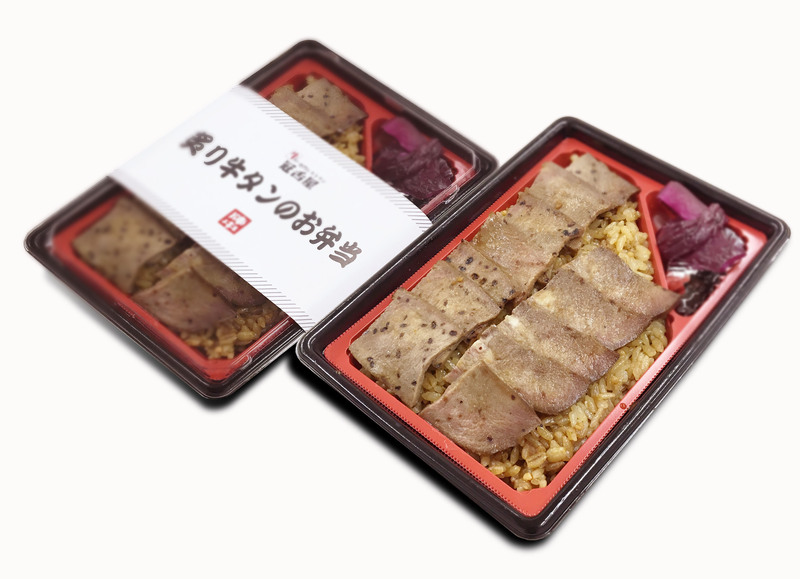 Ox tongue seasoned with Sendai miso is sandwiched between a mixture of rice and barley. This is an appetizing dish which consists of sweet and salty ox tongue and rice and barley browned slightly. They are cut into bite-sized pieces so they are also perfect for when you feel peckish. 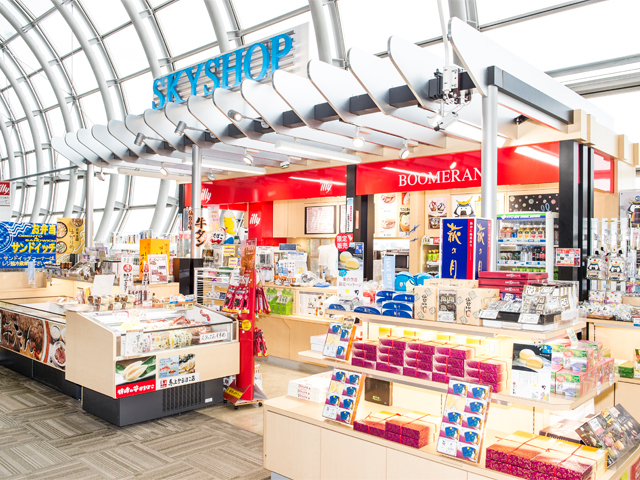 This is a popular product as Sendai's souvenir as well. 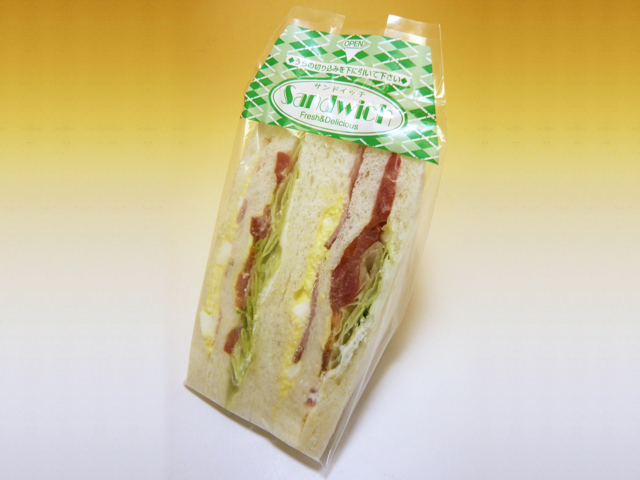 This sandwich is perfect for your light breakfast or when you feel peckish. This is a rice bowl dish which you can enjoy the exquisite texture of smoked ox tongue with. 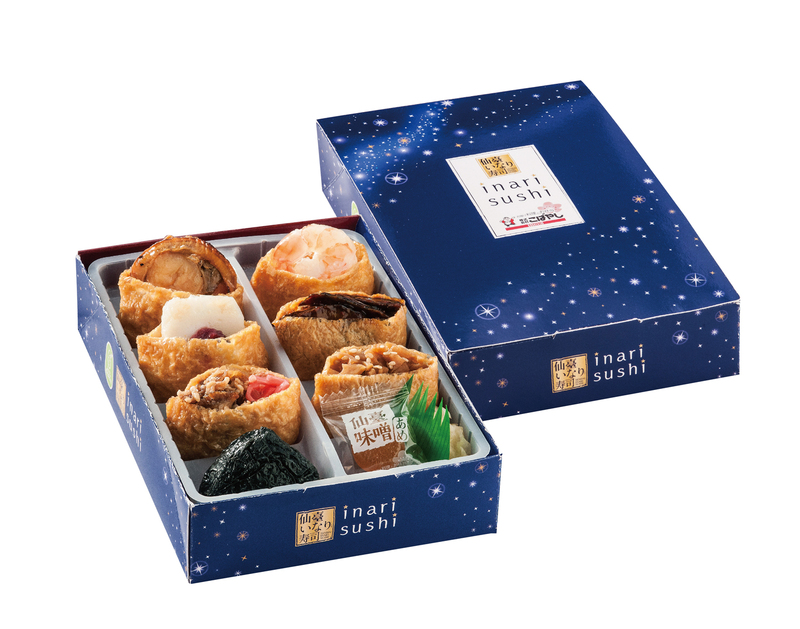 You can enjoy 7 different kinds of Inarizushi (a pouch of fried tofu filled with sushi rice and other ingredients) which are ox tongue, prawn, kinpira lotus root (stir fried and simmered with say sauce and sugar), scallop, Sasa-kamaboko and Japanese plum pulp, simmered sweet and salty beef and bamboo charcoal. 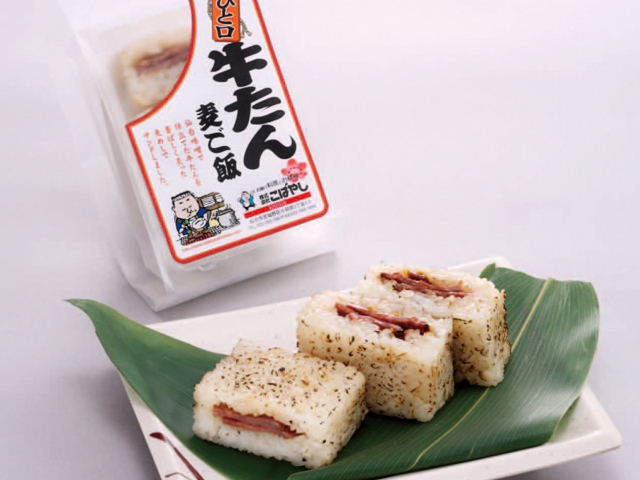 It also comes with Sendai miso candy as a dessert! 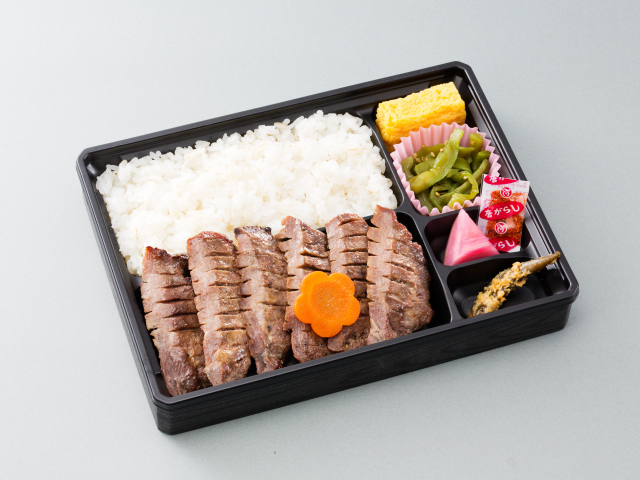 With this bento box you can enjoy every part of ox tongue such as the "root", "middle" and "tip". 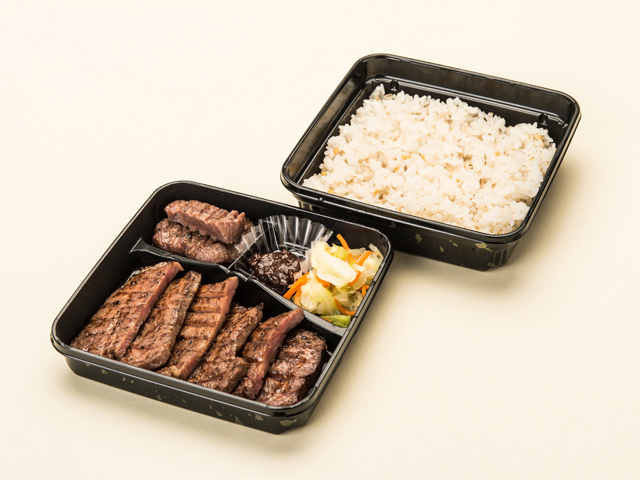 This bento features grilled ox tongue and they only use marbled parts of ox tongue for this bento box. Please enjoy the texture and flavor of these thick slices of marbled ox tongue. 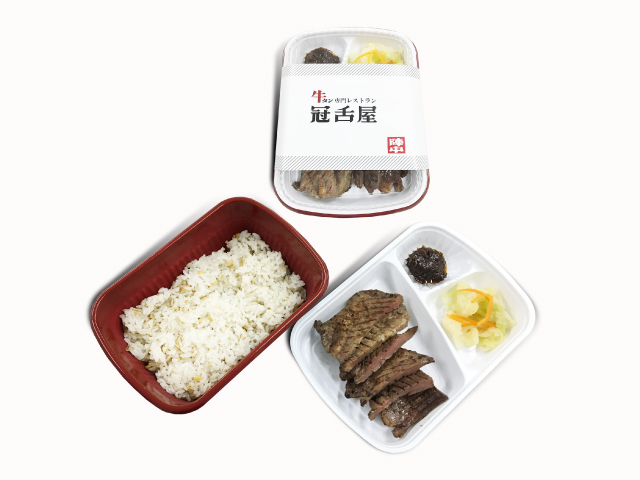 This is an ox tongue bento box of the finest quality which only uses the tenderest and tastiest part which can be only obtained one slice from each ox tongue.